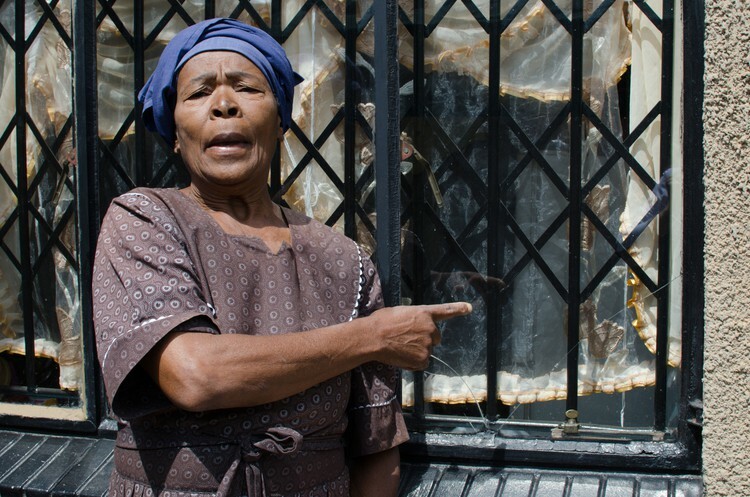 Kate Kobe, who lives in the Mpumalanga town of Phola, wants to know who will pay for the damage to her home. She and other residents say cracks and broken windows are caused by blasting at nearby coal mines. Photo: Ciaran Ryan . Last week Mineral Resources Minister Gwede Mantashe visited Phola, in Mpumalanga, to hear complaints that blasting from nearby coal mines was causing cracks in houses and broken windows. The visit concluded with an undertaking to determine whether the cracks were caused by blasting from mines already in operation or from other activities. The minister may be uncertain of the cause, but the residents of Phola are not. “The blasting happens every day and you can feel the houses shaking,” says Goodwell Matala, who once worked for the coal mines but lost his job several years ago. He points to windows at the front of his house which he says were broken by the ferocious shudder of coal mine blasts. The pattern is repeated up and down the street where Matala lives. Houses have shed their plaster coatings and internal cracks are clearly visible. In one house, the blast shock was so severe it brought down the ceiling, according to residents. This is coal country, and most of those lucky enough to have jobs work either for the nearby coal mines or the Kendal Power Station. Many of the residents complain that they are breathing dust stirred up by the blasting and ash dumps from Eskom power stations, creating respiratory conditions for those living nearby. Margaret Nkambule, a Phola resident, has been diagnosed with TB, and her three-year-old son Sbonokuhle has damaged hearing which she says is a result of the blasting. “The blasting sometimes happens when we are sleeping and dust falls down from the ceiling and goes into our lungs,” says Margaret’s husband, Shorty. Kate Kobe is a pensioner and she wanted a chance to speak to Mantashe at the Phola Community Hall about the damage caused to her modest home by the blasting. Like Goodwell Matala, she has stories of her own: blasting has disfigured her home and broken several windows. “Who’s going to pay for this?” she wants to know. Anglo American and South32 are the mining houses most residents blame for the blasting, but the Department of Mineral Resources (DMR) says their mines have not yet started blasting. White says an independent environmental control officer reporting to the DMR confirmed that construction activities at the Klipspruit Extension project are carried out in line with approvals. That doesn’t satisfy the residents of Phola, who are living in what may be one of the unhealthiest parts of the country. The local clinic is crowded with people complaining of breathing problems. And blasting is clearly taking place at mines in the area. Many studies have analysed the health hazards for people working on and living close to coal mines. A 2012 study on Highveld air quality reported that the biggest contributors to the ambient air pollution were Eskom’s coal-fired power generation and mine haulage. An air quality management plan was put in place more than a decade ago to clean up air quality, but little appears to have changed, according to Broken Promises, a 2017 report by the Centre for Environmental Rights (CER). Timothy Lloyd of the CER says people battling TB and other debilitating illnesses from having worked in coal mines are often left with medical bills to pay, as well as transport costs to a distant hospital. They have to deal with the constant fallout from a nearby ash dump aggravating their conditions. the total costs associated with these impacts exceed US$2 billion (approximately R28 billion) a year. These numbers exclude the significant impacts from air pollution from mining (such as coal dust), transport of coal, and contamination of water (as well as the impacts from other pollutants emitted by Eskom stations). Human rights lawyer Richard Spoor, who successfully sued Gencor and Swiss multinational Eternit on behalf of miners suffering diseases as a result of exposure to asbestos, has more recently taken up the cause of coal miners. He has launched a court case against a coal company claiming damages on behalf of 22 underground coal miners suffering various work-related ailments. Spoor adds that blasting in the vicinity of mines is also a major problem whose costs are under-reported. Dr Jim te Water Naudé, a public health specialist based in Cape Town, confirms an abnormally high incidence of lung-related illnesses among more than 300 ex-coal miners tested on behalf of Spoor. Highveld coal mining areas are well known for high levels of air pollution through a combination of coal mining, dust from Eskom power station ash dumps and dust thrown up by haulage trucks, to name a few. What is less certain is which source is the main culprit. Our Zibulo colliery near Ogies – like all other Anglo American operations – adheres to the highest environmental management standards. We have established practices that set out how we interact with our communities and stakeholders. We aim to deliver on our commitment to ongoing and honest communication with our stakeholders. For example, Zibulo Colliery has a Community complaints and grievance procedure in place. All community complaints are investigated and acted on promptly. These are entered into the register that is available at the access gate to the opencast operation. We have other platforms like community forums have been set up to encourage ongoing communication. Zibulo Colliery has measures in place to manage other possible impacts like dust. Although all dust measuring data shows that Zibulo is not the source of the dust fall out, we have agreed to jointly with other mining companies to initiate a study into understanding not only the source of this dust but how best to alleviate the dust impact. We also use dust suppression on all mine roads. This involves the application of a chemical suppressant agent and water. The mine has a dedicated air quality management plan in place. The Zibulo opencast operation undertakes blasting activities from time to time. These activities, together with the mining plan, are regulated and approved by the Department of Mineral Resources and are within the legal requirements prescribed in the Mine Health and Safety Act.